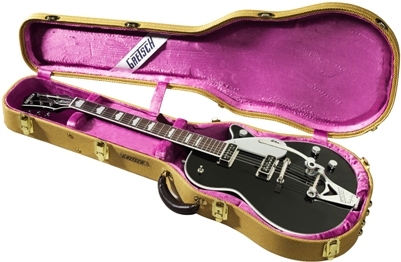 Shop Gretsch G6128T-GH George Harrison Signature Duo Jet with Case from AMS with 0% Interest Payment Plans and Free Shipping. The G6128T-GH George Harrison Duo Jet features distinctive appointments and modifications found on Harrison's original 1957 Gretsch Duo Jet, which he purchased secondhand in the very early 1960s. These include a lightweight mid-'50s-style chambered body, all-black color scheme (arched maple top, mahogany back and sides, and back of the one-piece mahogany neck), Bigsby B3C tailpiece with a black Phillips head tremolo arm pivot bolt, and an offset strap button on lower bout. George Harrison's signature Gretch guitar is the best guitar I have ever played--user friendly-well worth the price. Sound is deep and clear-better than my Gibson Les-Paul. 5 star rating ! This is a lifelong guitar to be passed down. The guitar is really made well. Can tell this guitar will be dependable for years to come. Just got the guitar but know my grandchildren will be enjoying the guitar when its my time to go. I hear people yell that Gretsch is made in Japan. I can tell you all honestly Gretsch Guitars are as good as they where back in the 60's. I should know I played a Country Gentleman back then. Every Gretsch I have played from the electromatics to the Falcons are made with high quality, my next investment will be a Gretsch Country Gentleman so take it from some who lived and played from the 60's. You can not go wrong with Gretsch. The guitar suprisingly is quite lite. Also the action is really great and neck is very comfortable. Volume and tone controls and easy accessale. Really well very high gloss shine. Like all guitars I have bought I always have my guitar set up by a luthier that I like in this area.